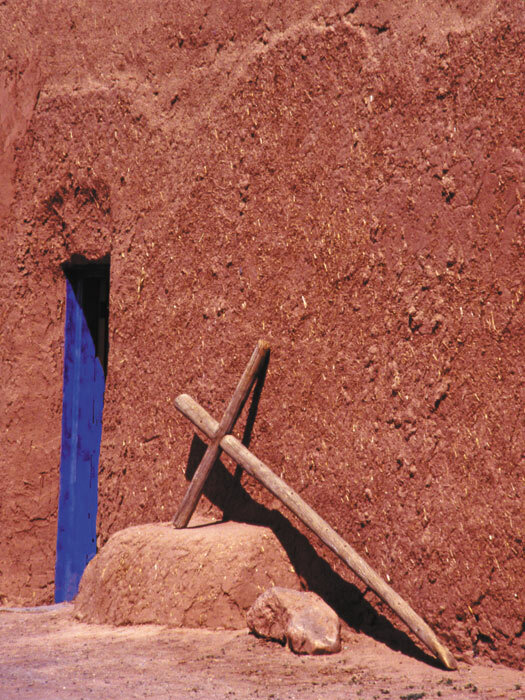 IT'S PART OF THE CULTURE AND THE LANDSCAPE - almost every village in New Mexico and southern Colorado has an old adobe and stone church, a humble capilla like this small family chapel in Pajarito, a morada or descanso. These are not grand monuments, they are from and of the earth, built by hand, with love and faith and it becomes an adventure to find and identify them. Selection from this series have been included in "Pilgrims and Promises", a collaboration of photographs and poetry with my cousin Karen Biddle. Images currently in the studio are listed below with sizes, descriptions and prices. Just as sacred are the Native American sites - especially the healing sites and the ruins of ancient cities. They hold a special place in my heart. I try to research the stories behind them and hope my interpretations are respectful. 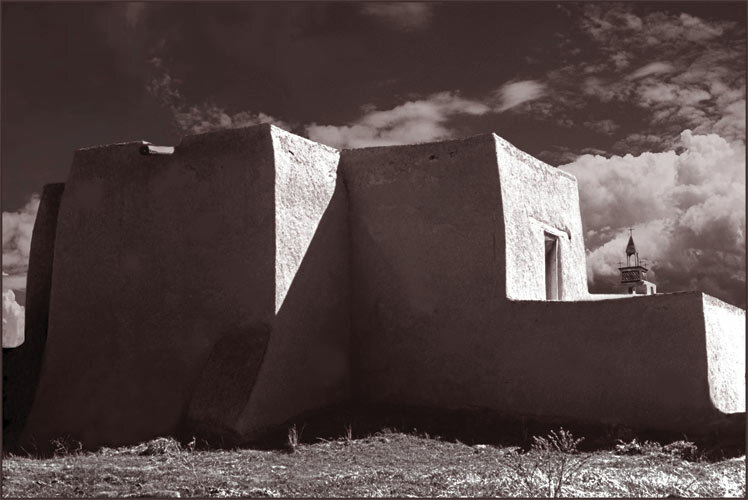 Completed in 1780, San José de Gracia is one of the best preserved examples of Spanish Colonial Mission architecture in New Mexico and perhaps in the US. Still an active parish, it was re-roofed and repaired in 1932 and completely restored in the 1970s. Villagers take turns keeping the key and are proud to show you this beautiful church. This image was scanned from a 4x5 negative taken in the late 1970s. The church is a National Historic Landmark. Limited edition Archival pigmented ink print on fine art paper, printed as a duotone. I have photographed and painted this family chapel in Pajarito many times over the years. It was in danger of collapse when I first saw it but family members and others came together to restore the chapel with help from Cornerstones Community Partnerships. Cornerstones works with communities to restore historic structures and reinforce cultural values. Archival print on fine art paper. The famous morada in Abiquiu has been memorialized in photos that include the entire structure and the three crosses on the horizon by Ansel Adams and many more. But on Good Friday some years ago I was taken by the simple Madero (the crucifix used in processions) resting beside the door. My husband and I were honored to be invited to join in the procession from one morada to the other, listening to Alabados of Los Hermanos. 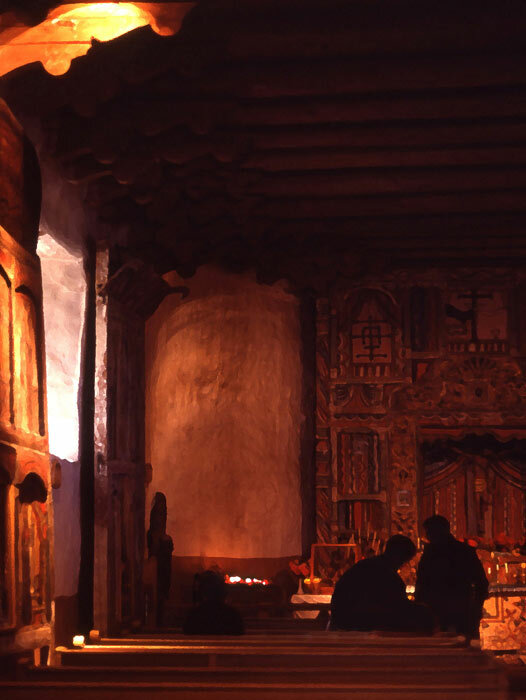 Inside El Santuario de Chimayó (which can no longer be photographed), the faithful lighting candles in prayer caught my eye. Taken with only natural light coming in the side window, everything was bathed in gold including the normally colorful altar screen. The most familiar view of El Santuario is outside from the front with the two bell towers prominant. 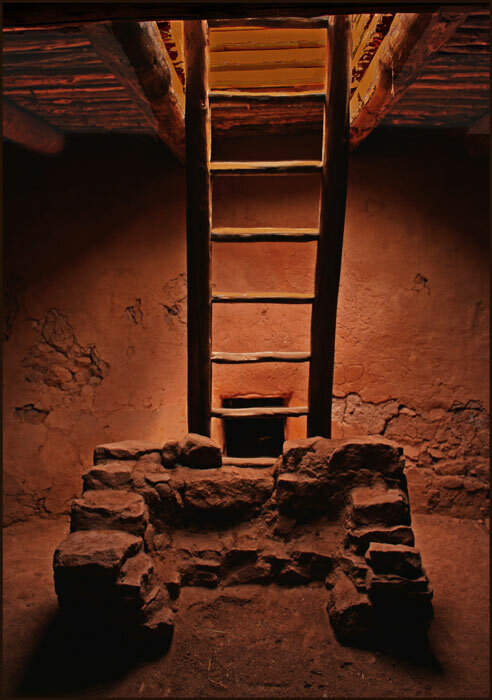 This restored kiva at Pecos National Historical Park was photographed with only natural light coming in the opening above. Once the largest and most populous of the New Mexico pueblos (2,500 people or more), they traded with Pueblos and Plains tribes, became economically powerful and practiced the arts and customs of both worlds. Epidemics and Comanche raids took their toll and by 1805 only 104 people remained. In 1838 elders from Jemez Pueblo, which speaks the same language, traveled to Pecos to invite the remaining 17 to come to Jemez to live. Their descendants remain there. Weathered adobe walls of a Spanish church share a ridge with the pueblo ruins, which extend for a quarter-mile. Take time to visit both Pecos and the Glorieta Battlefield National Historic Landmark nearby, the site of an important Civil War battle. The raven is a well-dressed bird - proud and intelligent - a self appointed messenger. The language skills of the raven contribute to the legend of their being the ultimate oracle. Raven symbolism goes back to the ancient Greeks and Romans. In southwestern tribes (Hopi, Navajo, Zuni) the raven flew out from the dark womb of the cosmos, and with it brought the light of the sun (dawning of understanding). Limited edition Archival pigmented ink print on Arches watercolor paper with the deckled edges showing. ﻿superbly framed ﻿by Framing Concepts - floated on a black background and then matted in a rich complimentary red and finished off with a simple black frame. raven flew out from the dark womb of the cosmos, and with it brought the light of the sun (dawning of understanding). Consequently, the raven is considered a venerated bird of creation, for without the raven, humans would forever live in darkness. This messenger was in a window at Pueblo Bonito in Chaco Canyon. Hawks touch something deep in our souls and it is said that Hawk medicine teaches you to be observant. For Native Americans, there are few symbols stronger than red-tailed hawks. To the Pueblo people of New Mexico, the red-tailed hawk is known as the red eagle. Its feathers and energy are used for healing ceremonies and for bringing the rains and waters necessary for life.